Business card and label maker pro is an extremely powerful label creation program that helps you with all your label and card making needs. With it, you can designing and printing professional business cards, address labels, mailing labels, shipping labels, letterheads, form letters, tickets, inventory tags, postcards, name badges, signs, envelopes and virtually any other type of label or card. 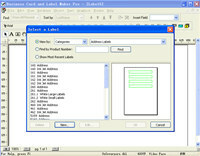 Business Card and Label Maker Pro is a business program that works under windows xp, windows vista, . It supports both 32-bit & 64-bit windows editions, therefore it could run faster on 64-bit computers. Estimated download time for Business Card and Label Maker Pro on a common adsl connection is less than a minute. Version 2.3.1 was released four thousand one hundred eighty days ago by iWinSoft.com. Click the green download button to download it now.